Triangle is an artist-founded non-profit art institution in New York City, working locally and globally since 1982. Our programs emphasize research, dialogue and experimentation through residencies and public programs. In this exhibit we have 5 artists who are part of the Triangle family. John Bjerklie, a current board member at Triangle; Aya Momose, a current resident at Triangle, Rachel Monosov and Lior Tamim, two alumnis of Triangle; and Azzah Sultan, the Program Coordinator at Triangle. John Bjerklie's character "BigHat" appears here in a 3 minute video in which he paints a portrait of "OkeyDokeyMan", another one of Bjerklie's characters. This is one of many videos in which Bjerklie performs as "BigHat" making paintings of various subjects, many of them portraits. "BigHat" performs live in a variety of venues, including bus stops, shopping carts, empty lots, restaurants, laundromats, factories and even art galleries. They are often broadcast from "undisclosed locations" and viewed on monitors placed in these locations. Many of the performances go on for hours in which many paintings are made. Sometimes visiting artists or other characters in Bjerklie's pantheon join in. The resulting videos, when played back are shown unedited. This video was made to be shown in a continuous loop for the duration of a six hour Open Studio reception at the Minoterie21 Artists Residency in France. It was recorded using a cell phone camera taped to a stick. Flags, which we often see in this political situation, function as a statement to be purposed more or less. And at the same time “flags” functions as a feast in a particular event. Throwing themselves on the ecstasy and rhythm, stimulated by the unconsciousness, the people who wave the flag are free from the personal subjectivity of the flag which usually are waved for a message to be stated. That is an impression made by collective conscious becoming into a whole, and has a vague fear to leave your body to something without doubt. 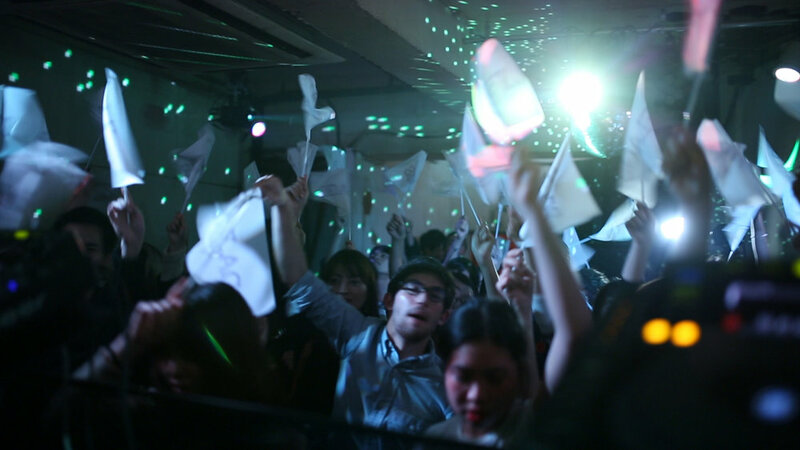 In this DJ event, I gave the visitor a flag that has been printed “FLAGS” on it, which does not have any meaning. A “flag” has been a nationalistic sign in this present tense. In a club space where there are no subjective energies flowed around in the space, I wanted to document the ambiguity relation of a flag which has been freed from the pure “waving the flag act” regressing into a feast, or a flag which still has some awkward allergy response against us. Oriental Woman is a piece that focuses on the negative stereotypes and the problems that muslim women face. Sultan started to collect images of Orientalist styled paintings by European artists from the 18th to 19th centuries, specifically those that were paintings of women from the East. These representations of an Oriental woman embody ideas of fantasy, myth and exoticism. These paintings don’t focus on one particular culture, but are a generalization of what a woman is like from what is considered the East. Orientalism as art creates a female counterpart to the masculinity of Europe — the women serve as a sexual object. These paintings show a culture that repress women and creates a fantasy of the feminine mysticism. These images are presented in a video one after another and the speed slowly increases, the video is then projected onto myself. 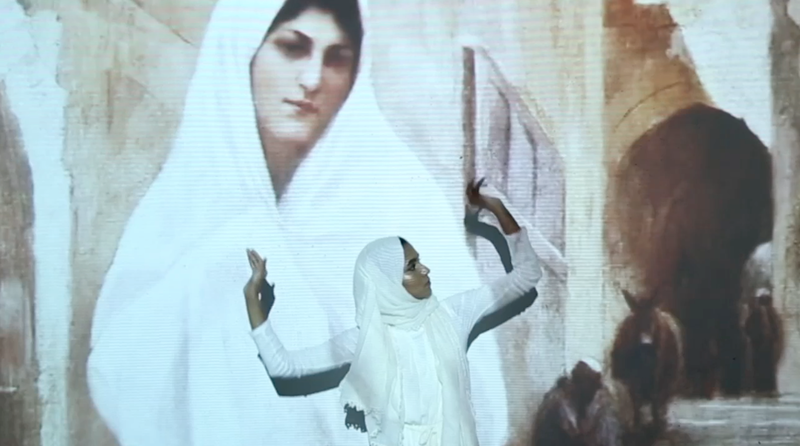 With these projected images, Sultan is performing hand gestures and movements that she learned when she was young through Malaysian dancing. Malaysian dancing was something her mother would teach her and instil in her practice in order for her to be reminded of her cultural roots. In this piece Sultan is in a conflict of demonstrating her culture and trying to defeat the exoticized view of women from the East, particularly Muslim women. "The red gig in the sky" is a blunt and sensationalized documentation of the artist exercising his power, aspiration, and desires towards various food products. The video is the second in a series of videos dedicated to deconstructing the bodybuilder character adopted by the artist two years ago. It focuses on the "special" physical abilities of the bodybuilder and shows a different use of various food products. The video surrounded by red color demonstrate sexual moment of climax, the edge point where food products changing their structure, being pushed to their max.